2 Chicken thighs and legs, precooked for 6 minutes (3 minutes on each side) in microwave. Wash rice well, add water and leave in Rice cooker. In a pan, fry the oil and add onions, stir and shallow fry for about 2 minutes or till browned, add tomato and stir for few more minutes. Cut the chicken into bite size pieces and add to pan, stir till lightly browned, finally add the Buriyani mix and stir. Add butter to the rice and cook the rice in rice cooker. 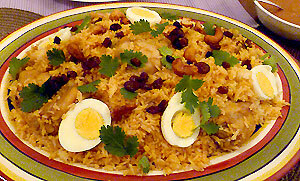 When nearly finished cooking, add the chicken, onion and tomato with buriyani mix. Mix well with a ladle. Wait till rice is completely done and transfer to a serving dish. In a pan, heat oil and deep fry boiled eggs (do not cut, fry it whole) till golden, cut into halves and arrange on top of the buriyani rice.